What Is The Eau Claire Express MVP Experience? 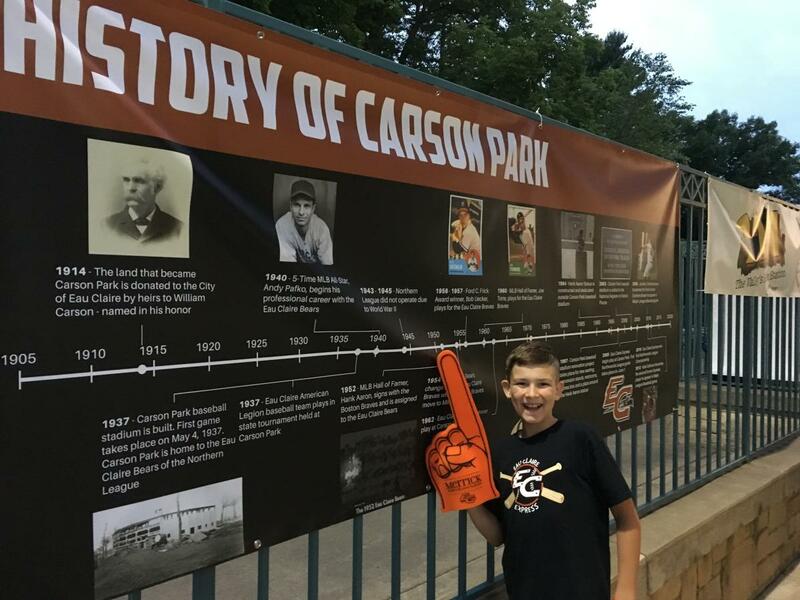 I have lived in Eau Claire for almost 30 years and have been to Carson Park numerous times… but I have to admit; I had no idea what an amazing place it is. On a rainy June afternoon, my son and I headed down to Carson Park to take the tour and learn all about the stadium and the team. Check out the blog he wrote about his experience here! We were greeted by Andy Neborak and Spencer Larson, two of the owners of the Eau Claire Express, along with some guy named Hank Aaron (they had a pre-recorded welcome from Eau Claire’s most famous player). After a short introduction at the Hank Aaron statue, we began our tour of this fantastic park. The tour began with some fantastic history. I knew the park had roots deep in Eau Claire history, but I had no idea how deep. The grandstand is a historical monument and can’t be altered from its original form. That explains the old, wooden steps. It explains the smaller concession stands. It explains the press box location and status. It is also REALLY cool. First things first, we had dinner with the team. I’m not going to lie; I’m pretty sure it is not what the Chicago Cubs eat pre-game, but the conversation was fantastic. After filling our plates with cold cuts, chips and fresh fruit, we sat down at the picnic table and were able to mingle with the players. The players were from Las Vegas, Texas, Minnesota and Chippewa Falls. For a few, it was their second season in Eau Claire, so they were telling us how happy they were to be back (I’m pretty sure the Texas boys were loving the 75-degree day). Another had just arrived two days beforehand and still couldn’t find Wisconsin on a map! They were majoring in everything from engineering to business. I have to congratulate these young men on how wonderful they were to my 10-year-old, baseball fanatic, son. They asked him all kinds of questions about HIS love of the game, such as who he played for, what position he liked and how many hits he had this year. They answered all his questions from what it was like to ‘be that good,’ to what kind of ice cream they liked. After several autographs and photos, we continued our tour. 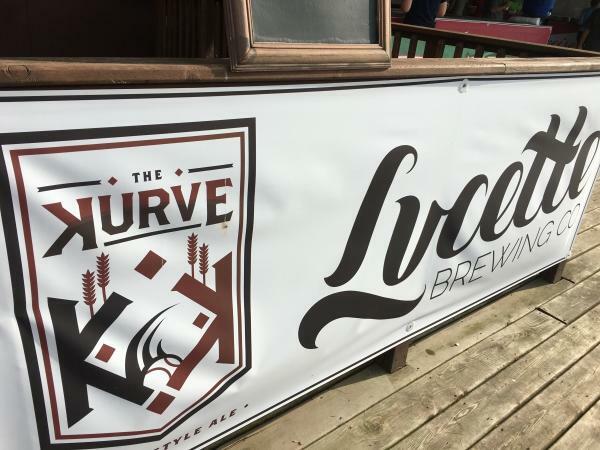 The next stop was the bar to test out the team’s official beer, The Kurve. Brewed locally by the Brewing Projekt, it also has a locally designed, very cool logo. A brief stop in the grandstand revealed several pennants hanging from the poles with names of Carson Park’s most famous players, the aforementioned Hank Aaron, Joe Torre, Bob Uecker and, more recently, Kole Calhon and Jordan Zimmerman (the Eau Claire Express alumni who now play in the major leagues). We climbed to the top and opened an old, metal hatch door that led us up to the press box. After walking along a ‘path’ on the roof, we found four separate wooden boxes. Spencer explained to us that because this was a historical site, there was very little upgrading they could do to the press boxes and had be sure to maintain the original form of the area as much as possible. The view from the box was beautiful, and the atmosphere was exciting as both teams and several press outlets were gearing up to begin the live stream broadcast, radio broadcast and PA announcements for the evening. We ended the evening down on the field. The Express players were out on the field warming up, but not with each other. 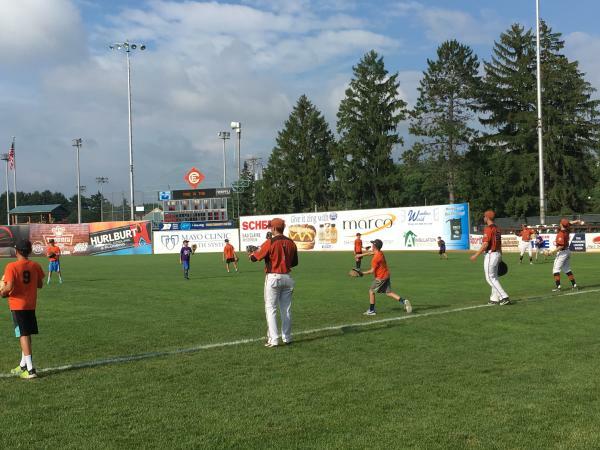 As is a tradition for the team, each home game they invite several of the area’s little league teams out on the field to warm them up. For these kids, being out on the field is a great experience-plus photos and autographs are encouraged. It was so wonderful to watch the players interact with the kids! A trip down towards home plate allowed for more photos and the ability to run the bases. The same baseline run by Aaron, Torre, Uecker, Calhoun and more. Crossing home under the historic grandstand certainly brought a sense of pride that I had never felt in that stadium before. I had no idea how amazing Carson Park was. Now, grab your hot dog, your cold Kurve and maybe some popcorn, because it is time to PLAY BALL! When you&apos;re checking out Carson Park, make sure to snap tons of photos are share them with us using #CaptureEC.